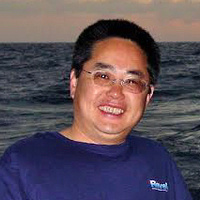 Join us for a seminar from Dr. Fei Chai, Professor at the School of Marine Sciences, University of Maine. Abstract: San Francisco Bay (SFB) is characterized as a high nutrient, low chlorophyll ecosystem under strong river and ocean influences. To investigate the phytoplankton and nutrient dynamics, a coupled physical-biological model is used to study this ecosystem regarding the seasonal and interannual variabilities. We evaluate the physical-biological model performance based on USGS water quality measurements from 2005 to 2014. Our analysis shows that the high chlorophyll concentration in South Bay is persistent in warm months, while chlorophyll in North Bay has strong interannual variation. Nutrient concentration is higher towards the upper North Bay and the lower in the South Bay, and large river flow influences its distribution in SFB. Also, the nutrient flux into the coastal ocean through Golden Gate is largely balanced by the nutrient flux from North Bay. A sensitivity model study on bottom clam grazing proves that it is one of potential causes for the low chlorophyll concentration in North Bay. The sensitivity of SFB ecosystem to the turbidity is also tested, which shows that North Bay and Central Bay are sensitive to suspended particulate matter (SPM) changes. Sediment transport model is used to study the turbidity variation in SFB and its effect on the ecosystem. Based on the model results and observational data, we will further analyze the major factors related to turbidity variation and their implication for the phytoplankton growth in SFB.